A trio of 2018 milestones show that iShares iBoxx $ Investment Grade Corporate Bond ETF (LQD) is now an indispensable investment tool. Two decades ago few options were available to retail investors looking to assemble baskets of corporate bonds. One option was to call a broker, who in turn picked up the phone and worked orders through dealers on Wall Street. This process was often difficult and expensive. And it could take weeks–sometimes longer–to build a diversified bond portfolio. Instead, most people paid active managers to trade and manage bonds for them in mutual funds. Then came iShares iBoxx $ Investment Grade Corporate Bond ETF (LQD), the first-ever exchange traded fund tied to corporate bonds. Credit ETFs trade heavily now, but looking back to 2002, it’s hard to appreciate how novel LQD was at the time. It tracked a well-known index of investment grade bonds, providing diversification and trading efficiency. Suddenly, individual investors could access the broad corporate bond market. A mix of 100 corporate bonds could be purchased for just pennies in bid/ask spread and 0.15% per year in fund expenses. Many institutional investors became aware of LQD during the financial crisis. As bond markets seized up, LQD continued to trade on exchange throughout the day, providing real-time markets and price discovery–especially during the memorable week roughly one decade ago that Lehman Brothers declared bankruptcy. LQD’s trading volumes have climbed as investors recognized the fund’s utility. 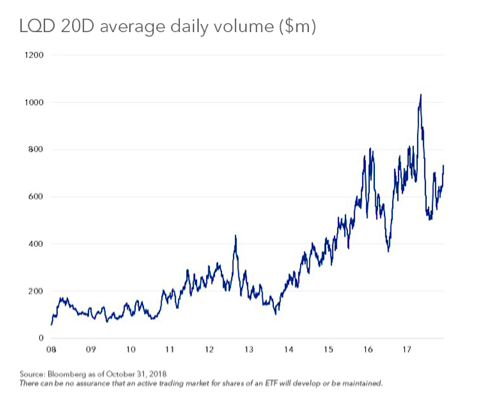 Liquidity, as measured by average daily volume, has grown steadily; liquidity spurred more liquidity, and encouraged additional adoption by institutional investors. The experience of LQD has been mirrored in other corners of the corporate debt market, where iShares iBoxx $ High Yield Corporate Bond ETF (HYG) has become a de facto proxy and trading instrument for the high-yield bond market. Indeed, HYG’s trading volume as a percentage of total daily volume in individual high-yield bonds rose to 19% in October, a record. Sixteen years after the launch of LQD, the ETF has $34 billion in assets under management. It trades $725 million on average each day, up 38% from a year ago. In stressed market conditions, it has traded even more, recently as much as $2.1 billion. As volumes grow, investors can now use LQD to quickly obtain diversified exposure to more than 1,000 bonds with a single, on-exchange trade. Investors’ predilection for LQD continues to surface in notable ways. Last year was the first time that LQD’s average daily volumes surpassed that of the most liquid individual investment grade bonds, including Verizon and JP Morgan.Adoption by insurance companies, whose portfolios rely on stable fixed income exposures, recently made LQD their most heavily owned ETF across industry portfolios. Earlier this year, LQD broke the record for the single-largest “block” trade in bond ETF history, a signal that large, institutional investors are confident about their ability to trade and manage risk with LQD in size. What do investors get with LQD? Beyond liquidity, LQD offers investors a highly diversified exposure to the investment grade corporate bond market across more than 1,000 bonds. 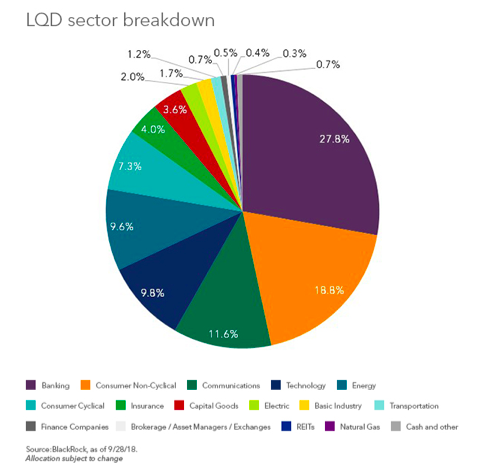 LQD seeks to track a broad index, providing investors with access to bonds in all major sectors, including communications services and industrials. That makes the product potentially suitable for investors seeking broad exposure to the investment grade corporate bond market. For investors with more targeted views, the LQD family suite offers choices to access the investment grade corporate bond market more narrowly. The iShares 0-5 Year Investment Grade Corporate Bond ETF (SLQD) offers access to bonds with shorter maturities; the iShares 5-10 Year Investment Grade Corporate Bond ETF (MLQD) offers access to bonds with medium maturities; and the iShares 10+ Year Investment Grade Corporate Bond ETF (LLQD) offers access to bonds with longer maturities. The iShares Interest Rate Hedged Corporate Bond ETF (LQDH) allows investors to seek to mitigate interest rate risk and express a more direct view of bond issuers’ financial health, and the iShares Inflation Hedged Corporate Bond ETF (LQDI allows investors to specifically hedge against inflation risk while still owning LQD’s corporate bond exposure. We believe that even more milestones lie ahead for LQD and bond ETFs in general as a growing chorus of investors recognize the benefits that bond ETFs provide in terms of access, efficiency and liquidity. Taken together, the iShares suite of investment grade bond ETFs are indispensable tools for investors of all types and sizes to access and manage risk in the investment grade bond market. Bloomberg, BlackRock, FINRA TRACE; HYG’s one month rolling exchange volumes as percentage of high-yield cash bond volumes hit a record on Oct. 31, 2018; (HY OTC 144a volumes are included in the HY cash volumes). BlackRock as of Sept 28, 2018. S&P Global Market Intelligence data compiled April 10, 2018. The Fund is actively managed and does not seek to replicate the performance of a specified index. The Fund may have a higher portfolio turnover than funds that seek to replicate the performance of an index. There is no guarantee that interest rate risk will be reduced or eliminated within the Fund. LQDI: The Fund’s use of derivatives may reduce the Fund’s returns and/or increase volatility and subject the Fund to counterparty risk, which is the risk that the other party in the transaction will not fulfill its contractual obligation. The Fund could suffer losses related to its derivative positions because of a possible lack of liquidity in the secondary market and as a result of unanticipated market movements, which losses are potentially unlimited. There can be no assurance that the Fund’s hedging transactions will be effective. The Fund’s use of inflation hedging instruments is intended solely to mitigate inflation risk and is not intended to mitigate credit risk, interest rate risk, or other factors influencing the price of investment-grade corporate bonds, which may have a greater impact on the bonds’ returns than inflation. There is no guarantee that the Fund’s positions in inflation hedging instruments will reduce or completely eliminate inflation risk within the fund. LQDH: The Fund’s use of derivatives may reduce the Fund’s returns and/or increase volatility and subject the Fund to counterparty risk, which is the risk that the other party in the transaction will not fulfill its contractual obligation. The Fund could suffer losses related to its derivative positions because of a possible lack of liquidity in the secondary market and as a result of unanticipated market movements, which losses are potentially unlimited. There can be no assurance that the Fund’s hedging transactions will be effective. There can be no assurance that an active trading market for shares of an ETF will develop or be maintained. Diversification and asset allocation may not protect against market risk or loss of principal. Transactions in shares of ETFs will result in brokerage commissions and will generate tax consequences. All regulated investment companies are obliged to distribute portfolio gains to shareholders. This information should not be relied upon as research, investment advice, or a recommendation regarding any products, strategies, or any security in particular. This material is strictly for illustrative, educational, or informational purposes and is subject to change. The iShares Funds are not sponsored, endorsed, issued, sold or promoted by Markit Indices Limited, nor does this company make any representation regarding the advisability of investing in the Funds. 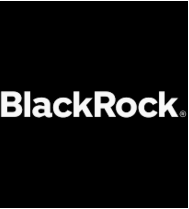 BlackRock is not affiliated with Markit Indices Limited. About "BlackRock, Build on Insight"
BlackRock, headquartered in New York, is considered the largest asset manager in the world.